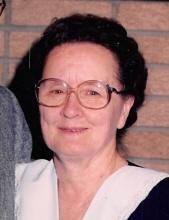 Gladys Gooch Johnson, age 94, of Marianna, Florida went home to be with the lord on Tuesday, February 5, 2019, after suffering a prolonged illness. She was preceded in death by her husband, James E. Johnson. She is survived by three children and their spouses, James E. and Joyce Johnson of Huntington, Texas, Sharon and Virgil Lipford of Marianna, Florida, Pat and David Leiter of Manheim, Pennsylvania; five grandchildren, Joel Johnson, Kimberley Johnson, Jason Lipford, Jana Rednour, and Brandon Guidry; seven great-grandchildren, Jeremy Johnson, Jordan Johnson, Faith Johnson, Lance Johnson, Nathan lip ford, Katie Patrick, John Rednour IV, and Josiah Rednour; one great-great-grandchild, Isabella Rose Johnson and a very special niece, Carolyn McLemore of The Woodlands in Houston, Texas. To plant a tree in memory of Gladys Gooch Johnson, please visit our Tribute Store. "Email Address" would like to share the life celebration of Gladys Gooch Johnson. Click on the "link" to go to share a favorite memory or leave a condolence message for the family.